It was 95 years ago that J. Eliot Coit, who would later be called the father of the avocado industry, wrote the article “How to make the avocado tree bear.” In other words, we’ve always wished avocado trees gave us more fruit. One way to encourage production is to be the bee. 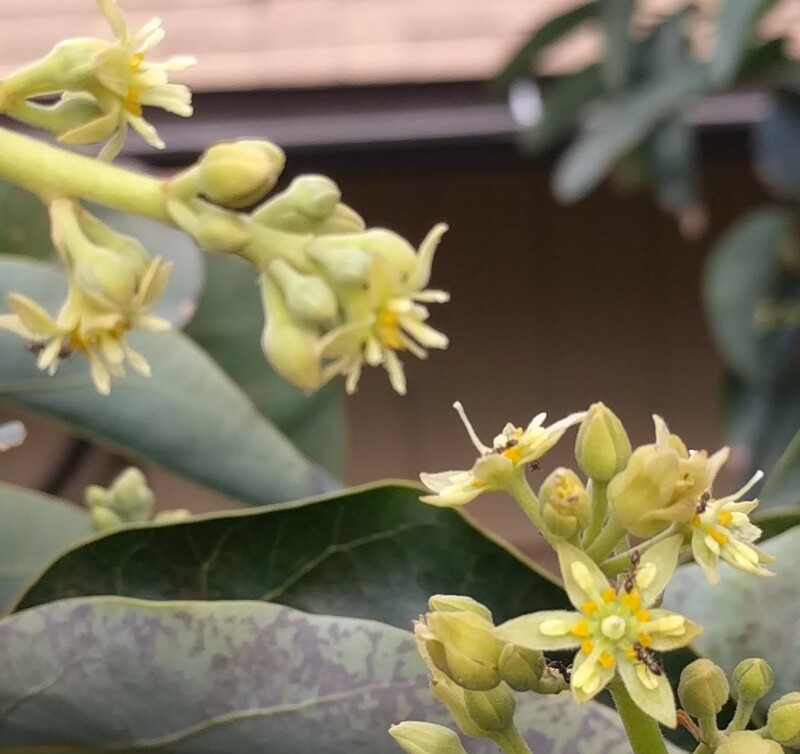 Avocado flowers are mostly pollinated by bees, but there’s nothing stopping us from using our hands and joining their pollen transfer party. 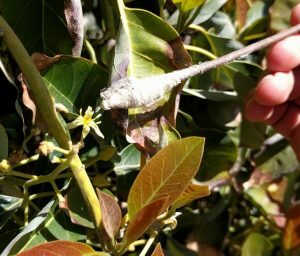 How can we hand pollinate avocado flowers? I’ve played with this for many years, but during this bloom season I’ve spent more time at it and learned better methods. 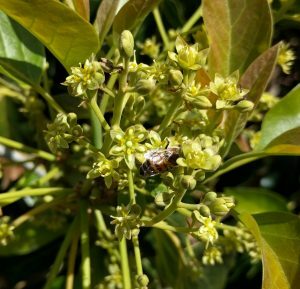 The essence of hand pollinating avocado flowers is simple: Put pollen on stigma. And the simplest method to achieve this is to take a male flower and touch it to a female flower. The male flower has the pollen and the female flower has the stigma. Scroll up to see the top photo again. That is what I’m doing there. I’m holding male flowers and I’m touching them to stigmas (which look like little upright sticks) of female flowers. How do you know if an avocado flower is male or female? The female has a stigma standing tall and alone in the center of the flower while the male has many parts standing up, those parts being the anthers which release pollen. To be specific, what you must do is use a male flower that is dehiscent, meaning the ends of its male parts (anthers) look tattered because they are releasing pollen. Male flowers are not dehiscent right when they open up; they start to release pollen after they’ve already been open for a little while. So pay attention to this characteristic. Then you lightly touch the male flower to the female’s stigma — lightly because you don’t want to damage this delicate part. This will leave pollen grains on the stigma and — Voila! — we have pollination. Before I go on to the second method of hand pollination, let me back up for a second and note that there actually aren’t male and female avocado flowers. All avocado flowers are the same in that they have both male and female parts. They open two times. On the first day they open and act like a female and then they close only to reopen the next day and act like a male. Strange indeed. My son pollinates his Fuerte avocado tree with male flowers from a Lamb. This direct contact method was found to be the most effective in a study of different hand-pollination methods on avocado flowers titled, “Optimization of controlled pollination in avocado” by M.L. Alcaraz and J.I. Hormaza. 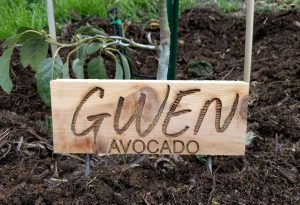 It is also a convenient method to use if you have both an A- and B-type avocado tree. You can collect male flowers from a B type in the morning to use immediately on an A type (which is female in the morning). Or you can collect male flowers from an A type in the evening to use on the females of a B type. Avocados are classified “A” or “B” according to the times of day they act like males or females. Some common A types: Hass, Reed, Pinkerton. Some common B types: Fuerte, Bacon, Zutano. Or two, visit your tree in the middle of the day when it has both male and female flowers. There is always a window of overlap of an hour or so. For example, in the photo below, my Pinkerton had both male and female flowers at 2:30 PM. That’s about the typical time of day when there’s overlap. But it does vary depending on the weather. Be aware, of course, that when you remove a male flower you are removing a potential avocado. So this is only something you’d do if you had a large tree that could spare flowers or a tree whose fruit you didn’t particularly adore. Or if your tree produces some flowers right near the ground where you wouldn’t want fruit to grow anyway, then just pluck those off. In the case of the Fuerte tree that my son is pollinating above, I collected male flowers from my Lamb tree because my Lamb had an “off” year last year and is currently flowering like crazy so I am reasonably sure it will set tons of fruit — more than it can hold until maturity — and won’t miss the handful of flowers I’ve taken. A slightly less effective method of hand pollinating avocado flowers is to use a tool to gather pollen from male flowers without actually removing the flowers. Many tools can be used, but most people use small paintbrushes. I’ve found that one of my wife’s makeup brushes works well. (Shhhh. She doesn’t know.) I’ve also used a Q-tip. But my favorite is a small stick that I wrap in cobwebs. I just spin the stick in a spidery corner. And when I brush it against a male flower the cobwebs have almost a magnetic attraction to the pollen. It seems to work very well. Collecting pollen with my cobweb stick. Anyhow, you brush a male flower to gather some pollen on your tool and then brush the pollen off onto a female’s stigma. Again, do this during the overlap time mid-day, or if you must wait for female flowers to open, then the pollen should still be viable. I’m not selling this idea. 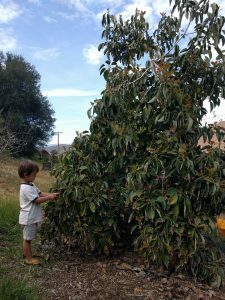 Hand-pollination of avocados is not a solution for a poorly bearing tree. Farmers don’t go around hand pollinating in their orchards, and Coit did not advise us to hand pollinate back in 1923. 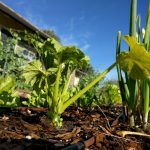 But for us home gardeners there are a couple of situations where hand pollinating might be worth the effort. 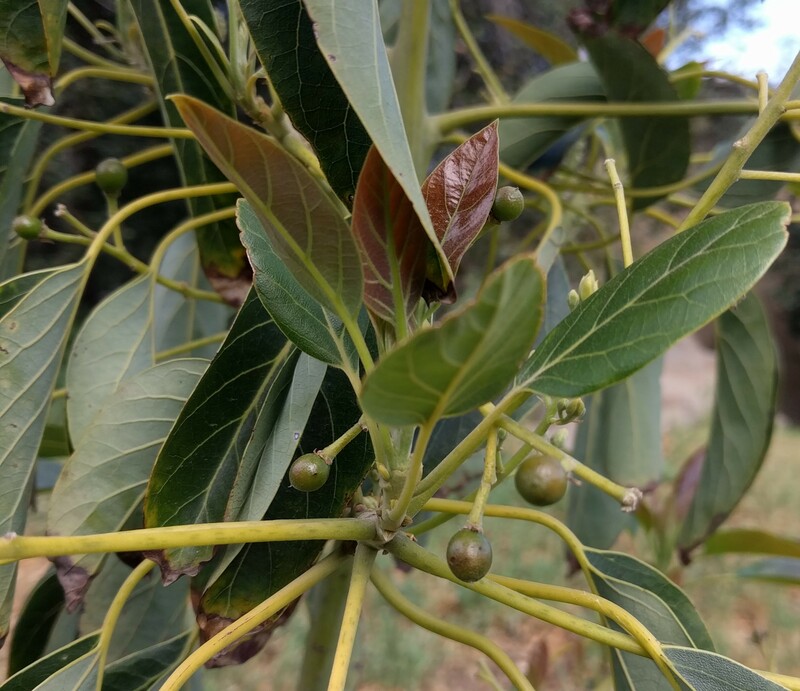 My Fuerte tree is far from my other avocado trees and so doesn’t benefit from cross-pollination opportunities. 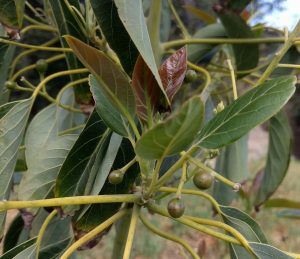 The Fuerte variety in particular is known to bear erratically, especially if it doesn’t have an opposite flowering avocado tree nearby. By doing some hand pollinating, I can fill that gap. If you have a young tree of a variety whose fruit you’ve never tasted, then you may want to hand pollinate in order to get a fruit or two as early as possible. Avocado fruitlets on Gwen variety. This is what we want to see! But don’t have unrealistically high expectations. Avocados on their own are inept at turning flowers into fruit, with a success rate of less than one percent. (See page 33 of Gary Bender’s Avocado Production in California for more on this.) A large avocado tree with a million flowers usually only turns out a couple hundred fruit in one year. But it doesn’t take very long to hand pollinate one hundred avocado flowers. It takes maybe ten minutes. And if I get even two Fuerte avocados for ten minutes of handiwork, well, that’s not a terrible wage. Wow! I never knew sensitive avocado trees are!! I will appreciate the fruit much more!! Thank you for all the helpful information that you provide on avocados!!! 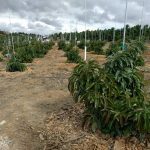 I took your earlier advise on where to get a Kona Sharwil avocado tree. From West LA all the way to Atkins Nursery in Fallbrook! After reading your article I checked my 4 years old Reed avocado. HAD tons of flowers but they all look dry. Did I underwater? Lost ALL the older leaves and most flowers. Have few new leaves. What happened? Good to hear you got your Sharwil. My guess is that you were seeing the flowers that had finished opening and had not been pollinated. Those ones dry and drop. But do you see any tiny avocados forming too? 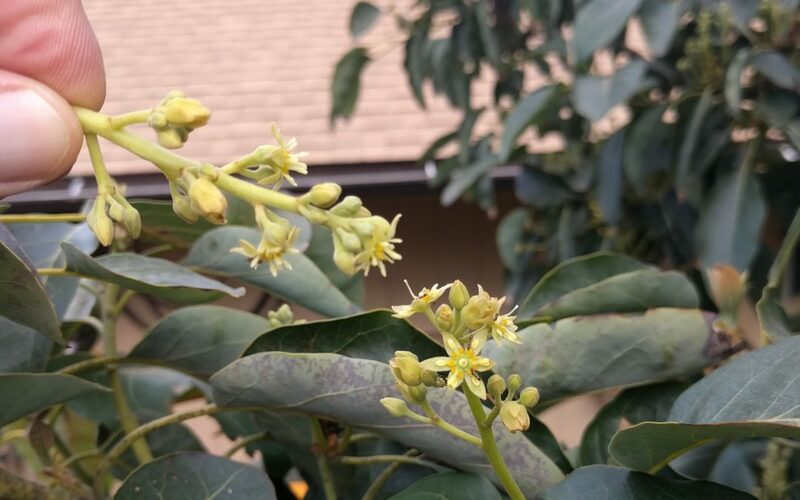 Reed avocados flower later than most other varieties. For example, mine has always continued to bloom even into June. So don’t give up hope on fruit set just yet. Avocados shed many of their older leaves now, at the same time that they flower. They also start growing new leaves about now. It’s their routine. Check the moisture in the soil where your tree’s roots are just to make sure there is enough. There are few tiny avocados formed. Hope that it will become mature fruit. I live in Elfin Forest. I have one avocado tree that I planted 21 years ago. (sadly the other avocado trees didn’t make it). 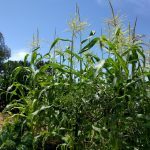 It produces huge crops almost every year. I’m wondering if that’s because there is a huge avocado grove a couple miles away? And there are a few wild bee colonies in the hills behind our property. Is your tree a Hass? 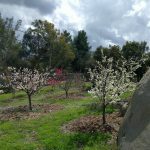 The nearby grove could be helping your tree’s fruitfulness with cross pollination, but maybe it’s that you’re getting visited by honey bees from their hives. 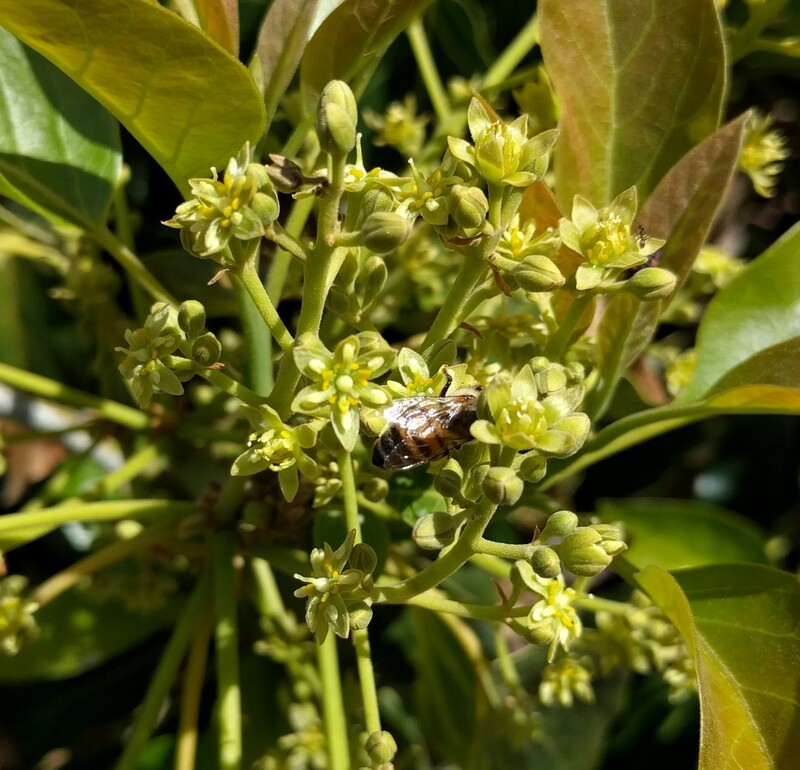 And I’d also guess that since you’ve got native vegetation all around you that there are plenty of wild, native bees and other flying insects visiting your avocado flowers. Or maybe you’ve got a super tree! Hi, I live in Canada and like to have a few plants in my house, I do have this avocado tree for approx 10 years, this year it decided to produce flower I’m doing the brush pollination, for now, I will try to find some spider web in this septic condo place. Also, Will do the fridge conservation, for now, would simply like to have one pollinated and making one avocado, that would probably make the local news here and my delight. If you have info and recommendation I would appreciate them, In the meantime keep fingers cross. Great to hear you’re growing an avocado in Canada! You want to preserve every flower on your tree so the paintbrush method is best for you. Don’t pick off any flowers. Can bees access the tree? Let them work the flowers as much as possible, especially in the middle of the day when there will be both male and female flowers. Best of luck! Let me know how it goes. How far away is your Fuerte from your other trees? Our neighbor has an avocado tree and we are curious as to whether or not it’s too far away to cross-pollinate with ours. I’ve read of research finding avocados pollenized by trees up to 250 feet away, but this distance can’t be counted on to make a significant increase in yield. The conclusions from most studies is that there is little effect on yield if the other avocado tree is more than about twenty feet away.